The directing mix of Clara Vaughn and Mwenya Kabwe adds fizz to the chemistry of The Little Prince. It is rare for a play to have two directors. There are important choices to be made when staging a show, and they are usually made under the dual pressure of time and money. Having two people in the position of making the call is a recipe for disaster. Except, when it’s not. When a partnership is able to produce work greater than what an individual could accomplish. Of course theatre is always a collaboration between director, cast, and lighting, sound, stage, and costume designers. It is not a dictatorship, or shouldn’t be, but someone has to be responsible for making the final choice on what goes where. The stage adaptation of the globally loved The Little Prince produced by the fledgling Kwasha! theatre company, has two directors. Fortunately for the millions of fans of the winsome book, the collaboration between Clara Vaughn and Mwenya Kabwe is not a disaster. Far from it. The Little Prince was a hit at its National Arts Festival premiere, where audiences and the critics in the stands loved it. Sheena Stannard praised it here, writing that this staged interpretation of Antoine de Saint-Exupéry’s book is “charming and delightful”. She gave it further praise, and had not a single criticism to add, which is highly unusual for The Critter. Which proves the point that when a directing collaboration works, it works very well. We’re not the only ones who think so. Kwasha!’s The Little Prince was chosen by international producers attending the Pan African Creative Exchange at the Vrystaat Arts Festival for an American tour which is coming up – details to be announced – and there is also talk of interest from Singapore. This also proves the worth of the Market Theatre Laboratory and new Windybrow Arts Centre’s programmes, for Kwasha!, which is housed at the Windybrow, is a company set up for Market Theatre Laboratory graduates to bridge the shift to their professional career. Mwenya says the foreign interest is partly due to the fame of de Saint-Exupéry’s book, which according to Wikipedia, sells close to two million copies a year and has been translated into 300 languages. It is also partly due to the use of a “South African physical theatre form which is interesting to internationals”. “I think they were interested in … the fact that it’s such a well known story. Its fame precedes it; there’s a number of translations of the book and they were interested in that it was a South African adaptation of the French text,” says Mwenya. “Generally there are so many different kinds of adaptations out there in writing and performance, and this was an unusual one. “It’s an all-black cast, which makes it kind of unlikely in some ways,” she says, as the Little Prince is a golden-haired child. The use of local languages and physical performance to prevent the story line being lost (especially for the adults) provides the “rollicking” quality of the “animated performances by the young cast” that Sheena describes in her review. Mwenya says they brought Daniel Buckland, who performed for a year or two with Cirque du Soleil, to do some circus training with the cast. At the same time, it remains true to the whimsy and contemplation, the disarming appeal to innocent and honest use of the imagination. As Sheena says, “the show closely adheres to the original story”. Deciding with Clara on how best to go about this was “a very organic collaboration”, says Mwenya at the start of a day of rehearsals with the cast ahead of their trip down to Cape Town. A lecturer at Wits until very recently, Mwenya has contributed independently to training at The ‘Lab, and found her and Clara’s creative lives were “crossing over more and more” and “the size of the project felt like it would only benefit from at least a couple of people on the directing side”. As an in-demand theatremaker and PhD student, and Clara also training new ‘Lab students, co-directing meant time in the rehearsal room can also be shared. “It’s been amazing to share the time in and out of the rehearsal space,” says Mwenya, with the cast also devising some of the work. That it has been able to work so well is also an indication of the generosity of spirit underpinning the production, which had to grapple with how to make sense of staging an illustrated European text in a way that makes sense for us here and now in South Africa. Clara said it was difficult to pin down exactly how co-directing with Mwenya came about. But when it comes down to nuts and bolts, it’s a “matter of compromise”, Clara explains. There were “big decisions around conceptualising it and making it relevant to South Africa and make it feel right here”. In this regard, Mwenya and her “came at it with very similar views”. At the same time, each had ideas they felt were important and on which they were loathe to compromise. Here, a constructive collaboration means those ideas are strengthened through interrogation and the need to motivate for them rather than a tussle between who is right and wrong. “We had an impassioned conversation about whether the paper aeroplanes should be released before the lights go down,” says Clara. Catch The Little Prince at The Magnet Theatre in Observatory on Friday 19 October at 7.30pm, and on Saturday 20 October at 2pm and 7.30pm. Book here. Cast: Balindile ka Ngcobo, Khanyisile Ngwabe, Lesego April Chabedi, Mathews Rantsoma, Sinehlanhla Megeyi. 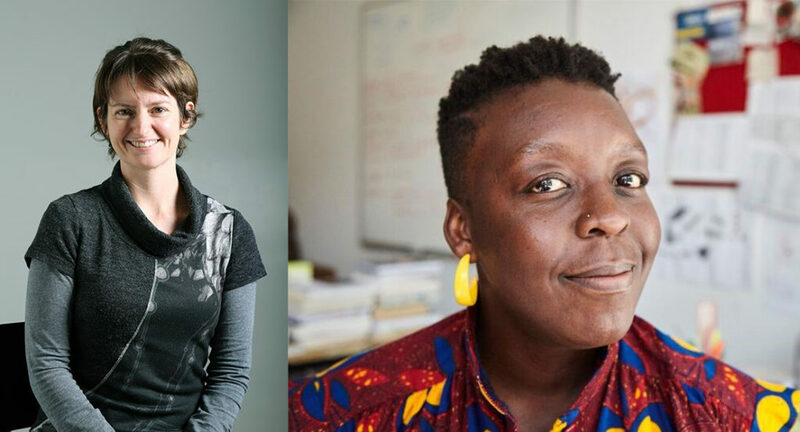 Directors: Clara Vaughn and Mwenya Kabwe.